Last year I promised to find one, and now here he is, with his bride and all in chocolate.
. 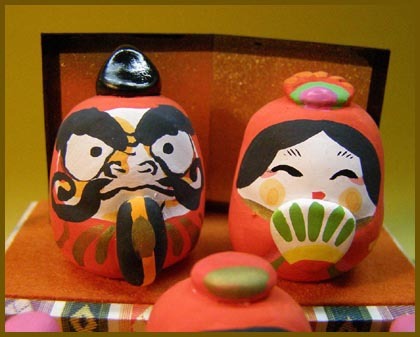 Folk Art in Japan - Hina Dolls . Hina Dolls from the Fukui Area. 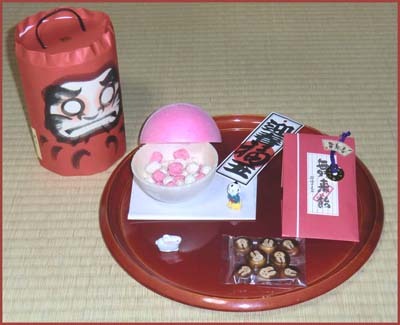 Click for more photos of Darumabina ! 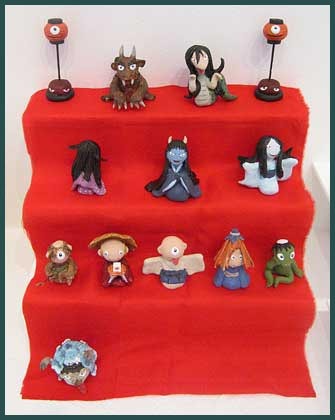 Traditionally, the dolls at the annual March 3 doll festival are displayed in tiers. But those currently on exhibit in Gujo, Gifu Prefecture, are acting out ordinary human activities, from drinking to washing. Some are even playing soccer. The unique “performances” of some 2,000 Hina dolls have attracted visitors to this city since the exhibit began on Feb. 9. Organizers say the event is also revitalizing the business community and hope to make this a new winter tradition in this tourist city best known for its summer festival.
. itobina 糸雛 string hina dolls .
. - yookai, yōkai 妖怪 Yokai monsters - . In the year 1745 in the home of the Dainagon Nakayama 中山大納言栄親卿 one day there came all kinds of things and goods flowing into the house. Exorcism rituals did not stop these strange happenings and in autumn the Dainagon died. later the mysterious power (kai-i 怪異) moved on to the 毘沙門堂里坊 Bishamon hall. There, during the Hina Festival, the dolls began to laugh all day long. In Miki town (Kagawa 香川県) there lived 三平 Sanpei san near Ninosaka 二ノ坂の焼き場. The family always decorated the Hina dolls and talked to them. One day the house burned down, but it seems that some strong force (お性根) had come to the house and saved the dolls, letting them roll out of the home. 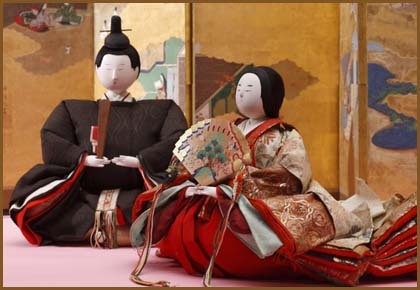 ..... suwari bina, or "sitting dolls." ..... "Kanei bina" ..... "Genroku bina." Making Hina dolls for the rich people of Edo was the job of some specialists. Different craftsmen made the head, the body and the robes. 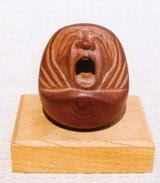 kashirashi, kashira-shi 頭師 makes the head of a Hina doll, the most important part, which gives the expression to a doll. 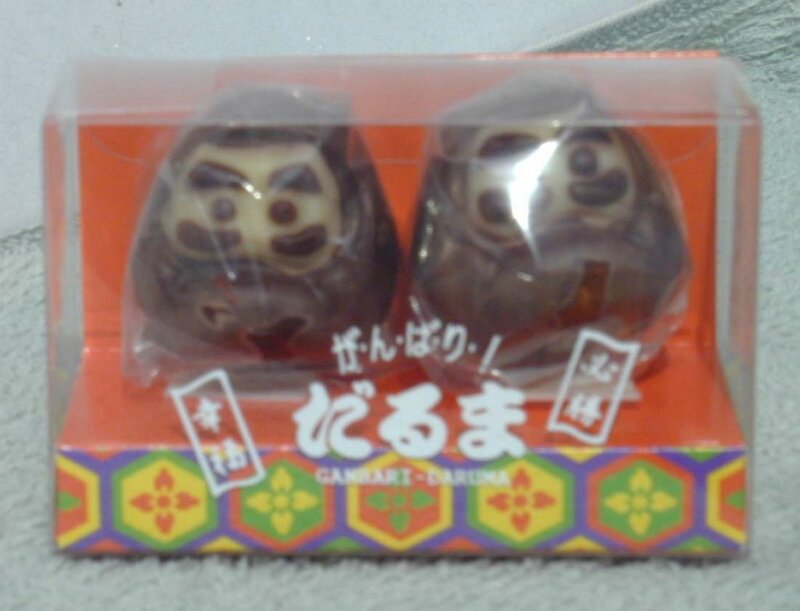 The head was mostly made from the wood of paulownia (tooso 桐塑). The wood is made to powder (kiriko 桐粉) and then kneaded with natural glue. When the form is done, it is whitened by layering it with gofun whitewash powder. Finally the colors are added. gofun 胡粉 is made from ground oyster shells or egg shells and special glue; it produces a shining, enameling white color for the surface of clay dolls. doo ningyo shi 胴人形師 makes the body of a doll, not only Hina dolls. He then adds the head, arms and legs. Sometimes these parts are fixed together, sometimes they can be taken apart for storage purposes. kitsukeshi 着付師 puts the robes on the doll. The body was usually padded up with straw and the robes had to fit over it.
. Yosa Buson 与謝蕪村 (1715-1783) . The nose of a hina doll! *The nose of a baby hina doll is not always well cut or prominent. Japanese children's noses are mostly flat. Mothers want them to be shapely, long, straight and elegant. So often they gently pinch up their children's noses while rearing them. * 'Tarachine' means sometime 'a mother, one's mother', sometime 'a father' and‘one's parents’. In the Haiku naturally it means a mum or mom. * ‘Tarachine no’ has been used since as early as the 8th century as a stylized epithet or a pillow word in tanka poems in phrases like ‘tarachine no haha (母) (mother)’ or ‘tarachine no oya (親) (parents)’. * The phrase ‘Tarachine no tsuma’ in the Haiku means that its mother pinches up (something). 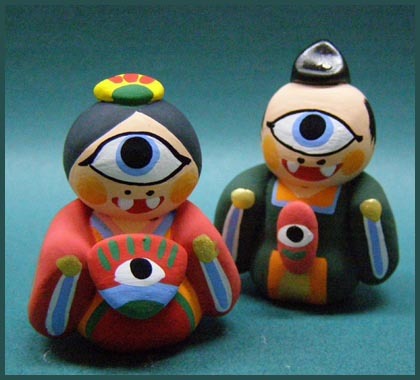 A laughing is excited by the association of mother's way of bringing up her child through the personification of a baby hina doll: she pinches up their noses with a prayer in her heart for their getting shapely. 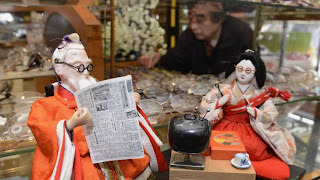 Prof. Ogata and Mr. Takahashi comment the　meaning of the Haiku is that 'the nose' of the hina doll should have been pinched up by its mother just like a living mother does. Joys and sorrows in daily lives are important sources of haikai poems or haiku. The Poet is skilled in catching and weaving them into haiku, and makes them full of human touches. 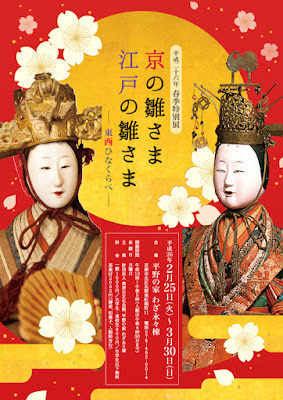 At the time when Jirozaemon-bina was enjoying steady popularity, a new type of hina doll appeared in Kyoto. 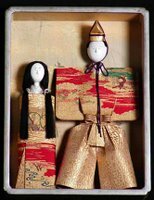 They were called Yusoku-bina as they were crafted by the yusoku method by which accurate historical evidence concerning the costumes of the court was ascertained. They were also known as Takakura-bina named after the Takakura family, the established connoisseur of yusoku knowledge who served the Imperial Palace. Placing emphasis on the observation of historical facts, the Yusoku-bina was made very realistic in all respects, including the facial features. In terms of costume, ikan (simplified sokutai) or noshi of the court were often used rather than the sokutai (ceremonial dress). The fabrics were specially woven in accordance with court rank, age and the season, without being simply limited to gold brocade. For example, in the case of the noshi, the style for winter was selected as the Hina Matsuri and was held in March (of the lunar calendar). The costume was tailored based on the design for those under thirty years of age, by employing white with deep purple or red colored lining. However, as these Yusoku-bina were originally produced for the nobility, they did not become popular among the general public. 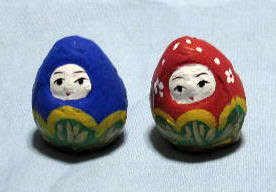 Nonetheless, they provided the later hina dolls with an example to follow concerning their realistic style. Japan's Doll Festival has a very curious history, one largely forgotten in contemporary times. Held annually on the first day of the snake on the third day of the third month in the old lunar calendar (March three in modern times) since the mid-to-late Edo period (1600-1867), it was originally a day for ritual purification known in Japanese as Jōshi no Sekku 上巳の節句 (literally “Seasonal Festival of the Snake”) when people would rub their bodies with crude human-shaped figurines made of paper, straw, clay or wood. These figurines served as “scapegoats” for taking on (exorcising) the spiritual pollution and bad karma of the devotee (see below). The word for snake (Jōshi) sounds like the word for girl (Joshi 女子), so the festival eventually became a day devoted to girls. Today the festival is a major joyous event but not a national holiday. 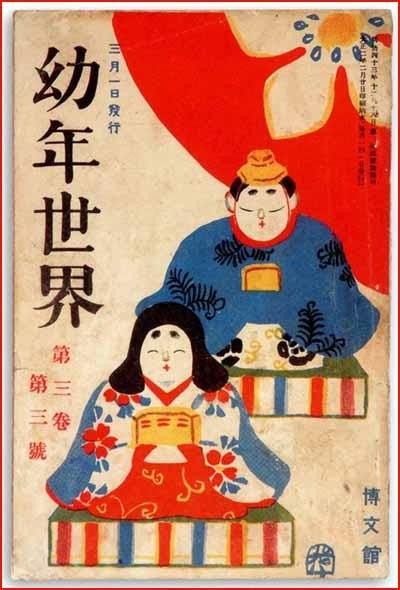 Geared towards girls -- the first sekku 節句 (seasonal festival) after the birth of a baby girl -- it is a day when charming dolls are set out for display to symbolize the family's wish that their daughter will be healthy, free from calamity and able to obtain a happy life with a good husband. 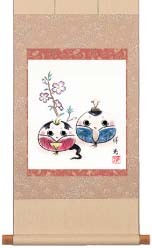 Also called the Peach Festival or Momo no Sekku 桃の節句, as March is the season when peach flowers are in bloom.